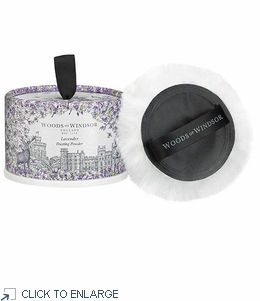 This softly scented Woods of Windsor dusting powder will leave your skin with a silky smooth texture. Lightly dust to seal in moisture. Leaves skin delicately scented and feeling refreshed. Traditional soft body puff enclosed. Made in England. Beautiful presentation; 100g with soft body puff. Dating back to the 18th century, Woods of Windsor is an aspirational range of luxury bath, body and home fragrance products that utilises the flowers, plants and essential oils that can be found in England's historical parks, gardens and stately homes. Inspired by recipes dating back to 1770, Woods of Windsor offers a range of innovative, high quality products, combining natural ingredients and modern technology.